Simple, inexpensive, reliable and discreet. 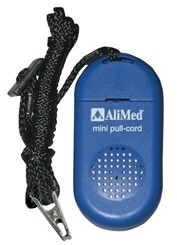 The IQ Mini Magnetic Pull Cord Alarm features a small design to help deter patient tampering. Magnetic pull-cord releases in any direction if pull-cord is separated from the mini alarm. AliMed® Worry-Free® Pull-Cord Alarm With the simplest and easiest functionality, the Worry-Free Pull-Cord Alarm requires no setup - simply switch it on and it's ready for immediate use providing fast, dependable fall monitoring. The alarm's permanent battery lasts up to 30 days under typical usage, making it an economical and disposable option for single-patient-use needs. Equipped with an adjustable clip for easy mounting, the Worry-Free Pull-Cord Alarm is a perfect local alarm for use with wheelchairs, chairs, or beds. Number of Delays 2 > 0 sec., 2 sec.